Am 5. November 2013 (ja diesen Monat) hab ich das Spiel neu gestartet und Ta~Da! Heute (19.11.13) habe ich die Hauptstory fertig gespielt XD Naja jetzt gehts dann weiter mit dem PokeDex füllen und was sonst noch so ansteht! In 2011 I bought a DSi and the Pokemon - Black Edition game. Yeah, I was 22 y.o at that time ヽ(;^o^ヽ) There were so many interessting games so I din't play Pokemon much. I started it, but came only to the 3rd city or something... But then...! Write a name for Reshiram in the comments!! Next month I chose one by umm.. drawing lots (?)! 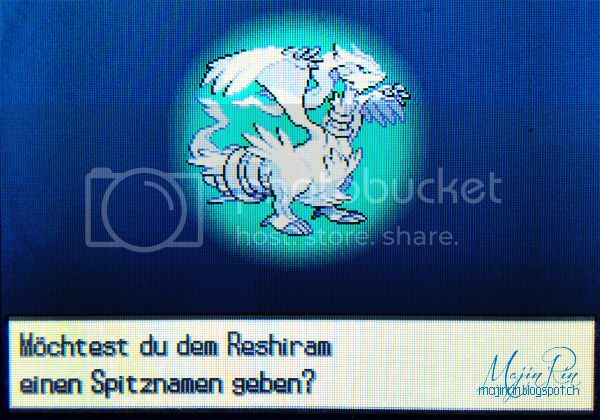 Kommt schon, macht mit und gibt meinem Reshiram einen Namen x3 Danke!